On friday, Tia and I went to the beach in the afternoon for a few hours. I bought a $4 inflatable ring for her to play with, that took some figuring out on how to blow up the cheap ring! She loved playing with it. 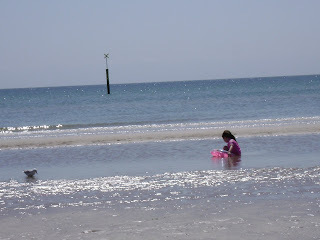 It was low tide, so she spent alot of time playing in the muddy sand in between a small pool of water stuck due to the sand and the tide all the way out. We had alot of fun towards the end, rolled up my pants and took her into where the beach was. Had her lay on her back on top of the ring, she loved it, just floating around being pushed by the waves. Whats odd coming from one who hates getting water on/in her eyes.. is what she enjoyed most when there was a bit of a tiny tiny surf (but the most ive ever seen at frankston) basically she rode the waves (like a metre away from where we were in the water) onto the sand where the waves ended on the increasing shore line (as the tide decided to come in) and splash on her, true thats how you end up with sand in your bathers.. but she wasnt thinking of that! she loved it.. I put sunscreen on my feet when we got there (thought the socks n shoes might rub it off on the walk?) and then was the only thing i re-applied sunscreen to half way thru the time we were there! lol! i think im paranoid over getting sun burnt feet again! We have been waiting for the bengal kittens to arrive at the pet shop, i wonder what they will look like? Had a place to move into in mind, its not available till saturday. I hate when you ring up a real estate agent that they promise to call you back and then they dont.. or you speak to the head receptionist of non-big brand rental real estate companies who never know whats going on.. But now ive got doubts on whether its close enough to a school, wary that im putting all my eggs into 1 basket when the photos online are 7 years old? isnt great to have time stamped photos.. lazy real estate people. That and why do some places have photos of the kitchen and the back yard or something but not the bedrooms? ugh..
Ive had some days where i feel completely zapped of energy at the drop of a hat.. feeling like i could so go back to sleep before lunch! ha! i looked up babies crying on youtube to show tia, that altho the baby is very quiet now its going to be very noisy. i came across this cute little funny cry. she is sooo cute.. i looked up births on youtube also, but felt anxious and a tad disturbed afterwards.. Cute bubba! I thought he/she was shivering aswell as "talking"? My goodness..re: the 7 year photo! I can remember viewing a place early last year.. and it looked a lot worse in real life. ie. garden was dried out and dead because of lack of watering (cos of the restrictions I imagine). Thanks for the beach pic.. very calm water. I wonder if Bengal cats shed (fur)? I suppose I could Google it.. but I'm feelin' lazy right now. Our cat Phoebe sheds and sheds.. I'm cleaning it up everyday...it gets on everything. 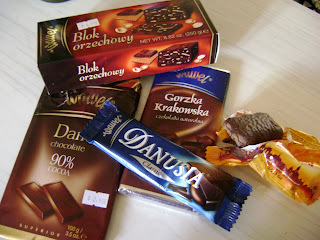 Interesting Polish chokkies! I've seen them for sale at fetes or festivals.. that kind of thing..but they aren't cheap. They look pretty.